This is an age old bodywork technique which is still practiced in China and other parts of Asia. The word "Gua" means to scrape and "Sha" from a TCM point of view, refers to the blood stasis or stagnant blood and qi that blocks the meridian pathway that can affect proper flow of energy and blood. Blood stasis will accumulate in the subcutaneous tissues. 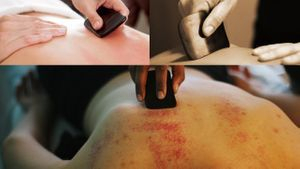 Benefits of Gua Sha: Pain and stiffness, Fever and chill, Neck and back pain, Flu and bronchitis, Earaches, Migraine headaches, Allergic inflammation, Asthma, coughing, and wheezing and Nausea.